After a long absence from the animal images I have finally added a new one to the collection. I remember watching the 1976 version of King Kong, as a kid. With Jessica Lang in it. Then later, the original black and white, with Fay Wray playing the heroine. I was pretty amazed, but obviously not as much as when Peter Jackson came along and added Naomi Watts in the role. Kong was so real, and fuelled my love for these creatures. I have always wanted to draw a gorilla in my work, but shied away from it. One day, looking at my bookshelf and Jared Diamond’s book “Collapse” the pieces fitted together for an image. The idea of ‘Empire’ fitting the building from this film and the notion of what an empire is. 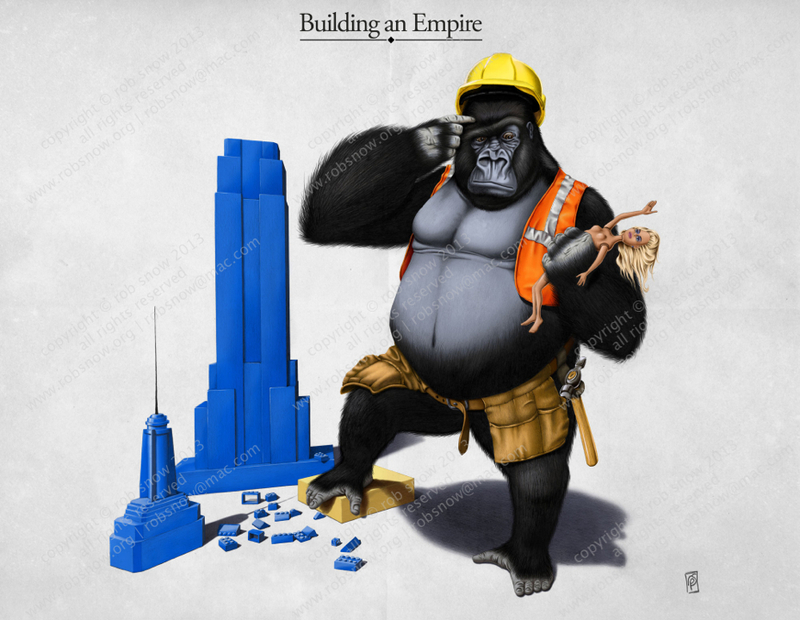 To build the ironic humour in all my images, I had the ape making the building from lego; a naive childhood toy, and to match his confusion I placed barbie as the antagonist to his achievements. This is the first illustration I completed at the new A1 size, and holds more detail than previous images. It will be the tailing image in my new book “Animal Behaviour II” which will be out at end of March.